Fuji’s Kassen is designed with the same excellent fit as the Fuji #7000 model. Durable and strong Pearl weave offers extreme comfort. You’ll love wearing this gi with the design inspired by one of the top MMA and BJJ fighters: Jeff The Frog Curran. Fuji’s Kassen is designed with the same excellent fit as the Fuji #7000 model. It is made from the Pearl weave which is durable and comfortable at the same time. You’ll love wearing this gi with the design inspired by one of the top MMA and BJJ fighters: Jeff The Frog Curran. Patched on both shoulders, one lapel side and 2 pants side legs and one circular patch along the leg. Patched on the right lapel to allow you to add your academy or own patch to the left lapel. 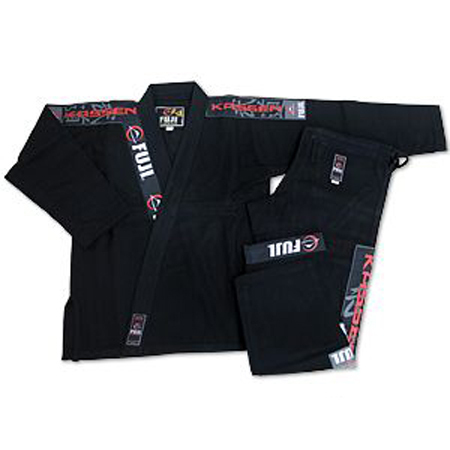 Click Here for BJJ Belts for Adult and Children.